The Guardian has rewritten the geographical bounds of the UK on Brexit Day, leaving many Irish people scratching their heads and wondering if the Republic of Ireland is being annexed. 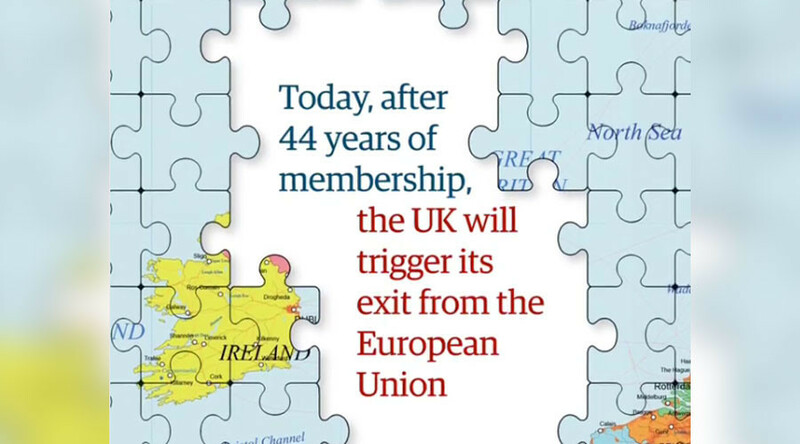 The British newspaper marked the historic process of triggering Article 50 by putting a cleverly designed jigsaw map of the EU on its front page, removing the pieces that represent the UK. However, it also took a substantial chunk of the Republic of Ireland, while excluding parts of Northern Ireland, leaving many Irish people baffled. A small section of France is also on route to leave the EU, according to the inaccurate cartographic depiction. Twitter users were quick to point out the epic fail, with many using the hashtag #JigsawProblems to air their grievances over the apparent rebordering of the island.